This chapter focuses on students with intellectual disabilities (IDs). Social skills instruction is needed for any disability category, but more so with students that are diagnosed with intellectual disabilities. Thus, use of the social skills service delivery model with ID students is examined through two case studies, one in a middle school setting and another in a high school setting. This chapter concludes with a discussion about the causes and characteristics, the educational placement and instructional strategies, and the eligibility criteria for students with an intellectual disability. The chapter concludes with a discussion about future trends for intellectually disabled students and service providers. The Individuals with Disabilities Education Act (2004) defines an intellectual disability as a “significantly sub-average general intellectual functioning, existing concurrently with deficits in adaptive behavior and manifested during the developmental period, that adversely affects a child's educational performance” (§ 300.8[c]). According to the U.S. Department of Education, National Center for Education Statistics (2012), there were 463,000 students with a diagnosis of intellectual disability (ID) in U.S. schools during the 2009-2010 school year. This type of disability has decreased significantly during the past 40 years. During the 1976-1977 school year, students with special needs who had an intellectual disability diagnosis were at 2.2% of the total school population, and this percentage decreased drastically to 0.9% during the 2009-2010 school year. According to Friend (2011), the reasons for this drastic decrease in numbers are twofold. One reason is that professionals in the field of special education have been able to make a better distinction between students with an intellectual disability and students who have a specific learning disability or an autism spectrum disorder. Second, because of the negative and offensive connotation of the term mental retardation, professionals within the field of special education became hesitant to label a child with this lifelong stigma. This type of disability tends to target more males than females, at a rate of approximately 2 to 1 (Friend, 2011). In addition, African American males are “three times more likely than other students” (Friend, 2011, p. 237) to be diagnosed as intellectually disabled. This disproportionality has caused professionals in the field of special education to take a second look at the students who are being evaluated for these services and to implement service delivery models like Response to Intervention (RTI) to assist students who are struggling so that only those who truly need intellectual disability services will advance through the tiers, be diagnosed properly, and receive those services. Examine the needs of intellectual disability students and the challenges they face on a daily basis. Discuss the causes and characteristics, educational placement and intervention strategies, and eligibility criteria for students with an intellectual disability. 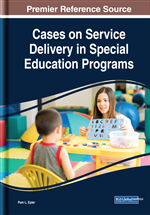 Present two case studies that utilize a social skills service delivery model with intellectually disabled students. Anticipate future trends for students with an intellectual disability. Chunking: Breaking down a concept into smaller parts or steps so that the information is easier to learn. Concrete Instruction: Using visual, auditory, and kinesthetic learning styles to teach. Intellectually Disabled: A person with certain limitations in intellectual functioning, communication skills, and social skills. Life Skills: Teaching students how to tend to their personal needs as well as teaching them how to ride on public transportation, clean their room and clothing, cook, bank, and so forth. Social Skills Service Delivery Model: A model built around teaching appropriate life skills through role playing or interaction with nondisabled people. Mental Retardation: Old term used to identify a person with an IQ of below 70. The new term is intellectual disability. Intellectual Functioning: A person’s ability to learn, think, solve problems, and make sense of the world. Adaptive Behavior: How well a student with a disability adjusts to a new situation or skill. Least Restrictive Environment (LRE): Educational environment in which the student with a disability will be educated. It can be in a general education classroom, a resource room, a self-contained classroom, an alternative school, or at home. The LRE must best fit the student’s academic and behavioral needs. Intelligence Quotient (IQ): The ratio of mental to chronological age.